Last Dollar Road, from Colorado Highway 62 at its north end, down to Colorado Highway 145 at its south end, has assumed mythical proportions. The road has stunning views any time of the year, but when the aspens turn color in late September and early October, it affords some of the best color views in Colorado. 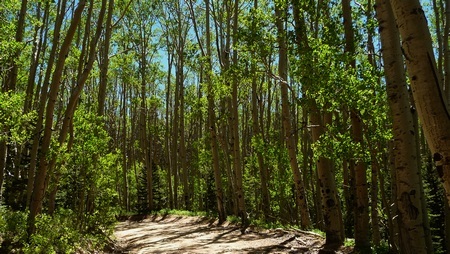 The leaves on these aspen trees are new and still bear their spring green—a light green that will give way to a richer summer green. They turn gold and orange in the fall. Last Dollar Road is also a great motorcycle road—I traveled it last Friday on my way to a much longer loop. 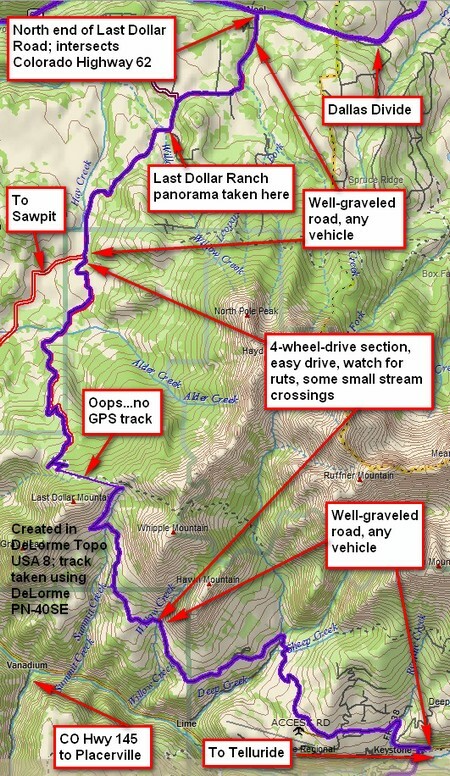 Much of it is well-graveled, wide road suitable for any vehicle, but the middle stretch is best attempted in a four-wheel drive vehicle or a carefully-driven sedan—you will need to ford a couple creeks. Right now the main creek ford is a bit deeper, but it’s easy to splash through to the other side. I would rate this road as easy and suitable for a beginning off-road motorcyclist, but do pay attention to occasional ruts. Also, there are some sections that are not only narrow but do not afford any visibility around cornerd. Stay way to the right and be prepared for the pickup trucks that sometimes barrel through! I’ve put the GPS track at the very bottom of the post because it’s a rather large image. 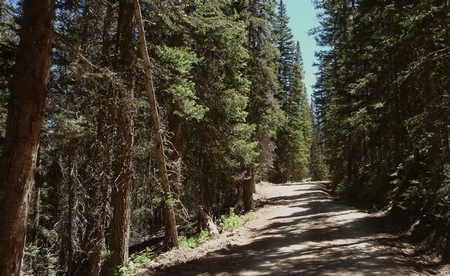 The north end of the road is a well-marked turn just west of Dallas Divide on Colorado Highway 62, west of Ridgway. As a motorcyclist, note that the road often has fresh gravel, which can make for squirrelly riding. As you travel the road from the north, you’ll go up a canyon and then come out onto a mesa near Last Dollar Ranch. The panorama below is taken at that point. Click on the image for a bigger and wider version. This is a section of an almost but not quite a complete 360-degree view. The left hand side of the image is east, the middle of the small image is south—the middle of the big image is west and curves to the north and back to the northeast. Click on the image for a larger and longer view. Use your browser's "back" button to return. The view is to the south. That's the 4WD portion of Last Dollar Road down there. After traveling down the road seen in the image above, the road climbs into the trees. There are a few tight switchbacks here. Watch for vehicles coming the other way—this is a popular road! The road winds to the east and up through conifers. Given the road isn't very wide, it's like being in primeval forest. These grand peaks are on the south-facing side of the Sneffels range. The GPS track below is almost complete. One little section, along the range where the conifer shot above was taken, was too deep in the canyon to get good GPS coverage. I’ve now changed where I put the GPS receiver. It’s on my back rather than on my chest. It seems to do better that way. Note that the 4WD portion of the road can get very muddy and slippery when wet. Here's the GPS track for the entire length of Last Dollar Road. The north end intersects Colorado Highway 62 just west of Dallas Divide. 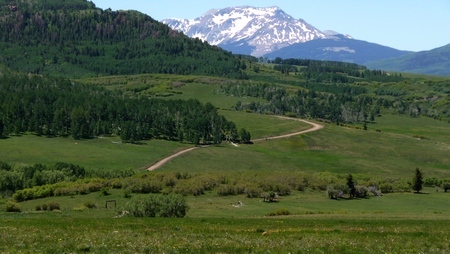 On the south it intersects CO Hwy 145 just west of Telluride. Dave, there are many places to camp, such as up at the end of Ouray CR 7, in the Silverjack area, and I’m sure you can find others. But on the high country roads, such as Engineer Pass, there aren’t so many places to camp, plus the roads aren’t all that good for a jeep pulling a trailer of any size. There are many public and private campgrounds around here for a nominal fee. The unimproved high country sites don’t charge a fee that I know of. love your off road videos.will be out there this fall. will be driving a jeep pulling a tiny camper that i normally pull behind my m otorcycle. want to go off road camping.are there any “trails” i can drag the camper without getting into a problem? been down last $ road for afew miles on my goldwing. read there is a place to camp on the road somewhere.i really want to see the backcountry & i would like to drag the camper. i am passed the age of tents! been out there just about every year for the last 20 years cant get enough. i cant figure out where people from your area go on vacation seems youre already there. In ” Country” (August/September issue) is article and nice pictures wrote by previous owner Vince Konty. In a country magazine, someone made a brief comment about “the last dollar ranch”. Can anyone tell me the story of this ranch? The pictures about are beautiful!